We released 3 beautiful shawls and a bold, modern cowl this past month! The Poet’s Corner Shawl with it’s rich deep purple and delicately ruffled edge, the Crisanta Shawl with it’s gentle crescent shape and botanical lace border, and the Anthemis Cowl with it’s bright, gradient stripes, all knit in our ethereal Valley Yarns Hatfield. 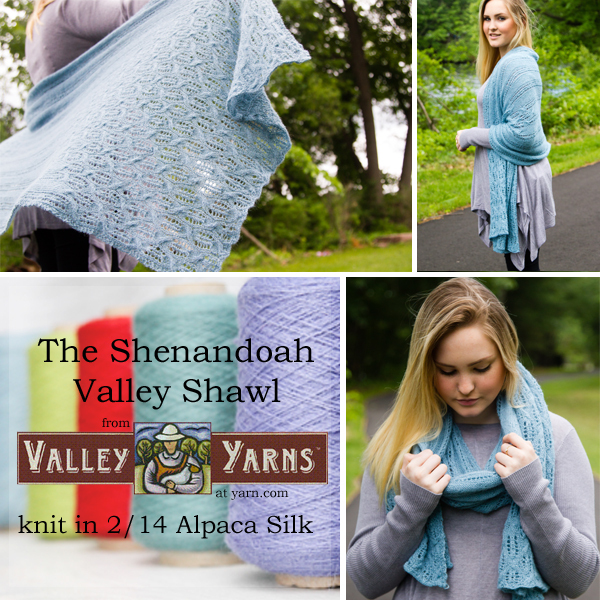 And the Shenandoah Valley Shawl, a stunning rectangular wrap with geometric cable and lace in one of our favorites, Valley Yarns 2/14 Alpaca Silk. 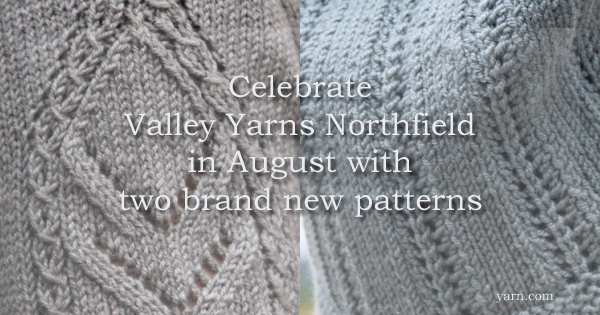 In August we’re gearing up for all new designs from our Fall 2016 catalog and two new patterns just for our Valley Yarns Northfield. Fall knitting is right around the corners and we’re ready! I love a good wrap. A nice wide shawl that I can snuggle into like a great knitted hug is a real comfort, but I don’t necessarily want to look like I’m wearing a blanket. 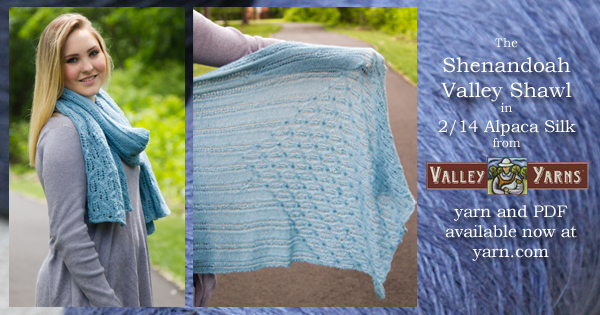 The new Shenandoah Valley Shawl designed by Katharine Malcolm is that perfect shawl! Knit in our Valley Yarns 2/14 Alpaca Silk it is gauzy and ephemeral but amazingly warm and cozy. The silk give the yarn strength and shine, while the alpaca give it that surprising warmth and a soft fuzzy halo. With a decreasing pattern of cables forming a mountain shaped border at each end and a gentle striping effect of stockinette and yarn overs, reminiscent of the rivers and streams, you get to see the best of the Shenandoah Valley in this shawl, the gorgeous Blue Ridge and Appalachian mountains as well as the James and Potomac rivers. And with the bonus of the incredible yardage of the 2/14 Alpaca Silk being offered on cones you will only have 2 tails to weave in at the ends of this project! Katharine talked to us about herself and how this design came to be. I taught myself how to knit before I was ten years old, a long time ago. The first article I can remember knitting was a woolen turtleneck, shaped, full fashioned sweater with mock cables on the front and the back. I was 12 at the time. In my college years, everyone knit in class. I knit my model train loving fiance a pair of socks with an original train on the side, but never thought of it as designing. The same was true as I knit for my sons and nephews, including whole animal families of hand puppets. It wasn’t until I became a TKGA Master Hand Knitter that I realized that what I had been doing for years was designing. I have been knitting my own designs ever since. I tend to find a design that I want to create in knitting and as I proceed, my ideas grow. That was the case with the Shenandoah Valley Shawl. It started as a project to work on a train trip and as I knit, I did not want it to be the same throughout, so I created the triangles. As I worked the shawl that you see I realized, looking out the window that the color matched the Blue Ridge Mountains. From another window I can see the Appalachian range and the Shawl fit in perfectly. Many of my designs evolve as I knit. When I was working towards the Masters Program for The Knitting Guild Association, I decided that since I lived on an alpaca farm, that I would create the yarn for the project. As a result, it was not only an original design for the vest and the long coat, but they were both knit from a one of a kind yarn. 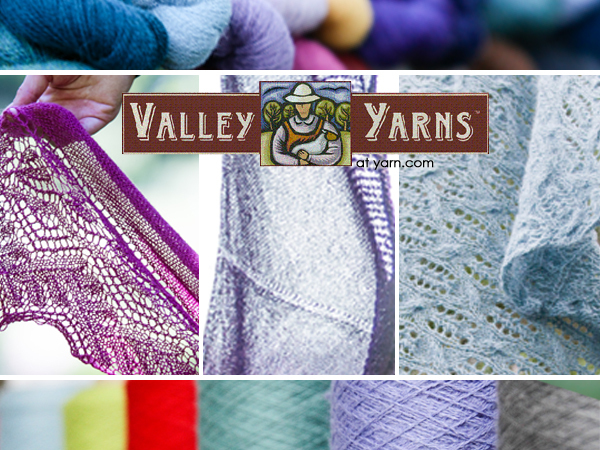 What did you love about the Valley Yarn you worked with? I loved the feel of the Alpaca/Silk. 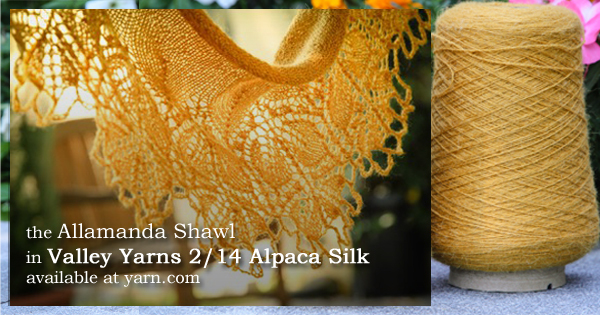 The silk adds a sheen to the alpaca and I loved working in color. I have been knitting with my hand spun, but none of the alpacas come in Whipple Blue! With a gorgeous combination of lace and cables, this light and airy yet scrumptiously warm shawl could be the perfect accessory, and with almost 30 colors of 2/14 Alpaca Silk to choose from you’re sure to find one that’s perfect for you. Download your copy of the pattern now and cast on! 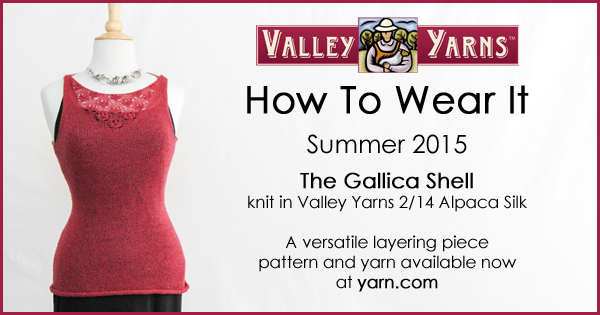 If you’re looking for a light garment to work on in the summer months that you can wear all year long then the Gallica Shell might be the pattern for you. 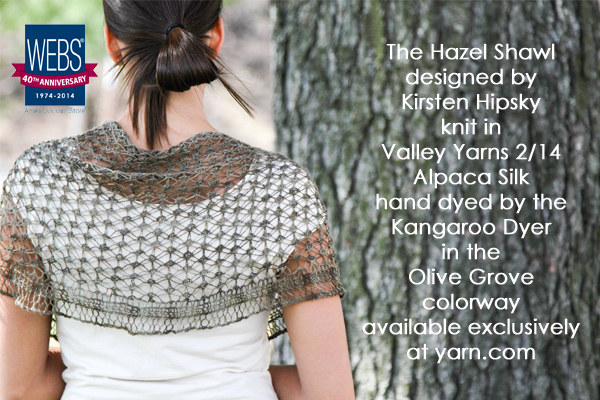 Knit in our Valley Yarns 2/14 Alpaca Silk at a relaxed gauge with a delicate lacy insert at the neckline. You can dress this one up or take it casual with ease. Velvety petals of a rose lace motif adorn the neckline of the Gallica Shell. This sheer, fitted, sleeveless top is worked from the top down – the lacy front yoke first, then the back – the remainder of the lower body is worked in the round and it’s easy to alter to the desired length! Choose from almost 30 colors of the 2/14 Alpaca Silk to suit your wardrobe. We’d love to see your finished garments! 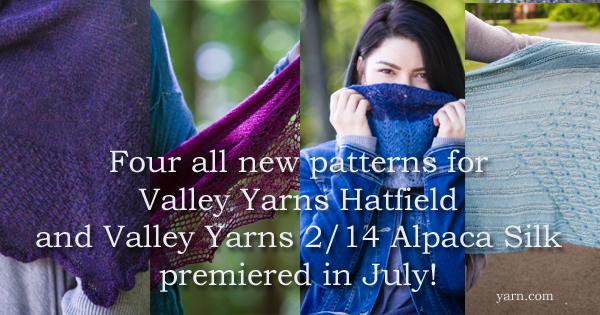 Anytime you’ve made a Valley Yarns pattern be sure to tag it with #VYwearit We may feature you here on the blog, highlight you on our Facebook page, or repost you on Instagram! 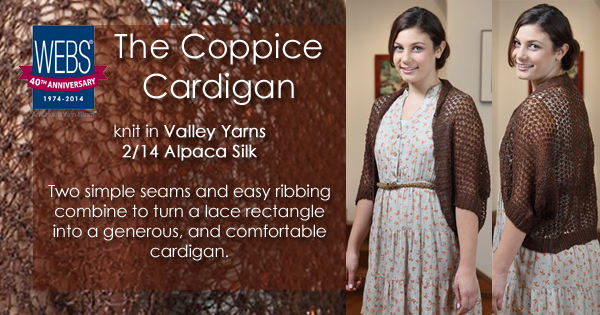 The Coppice Cardigan, in Valley Yarns 2/14 Alpaca Silk, may be one of the easiest lace cardigans there is to knit! The Hazel Shawl is a stunning, crescent shaped shawl in a delicate, knotted lace pattern that is just perfect for summer. 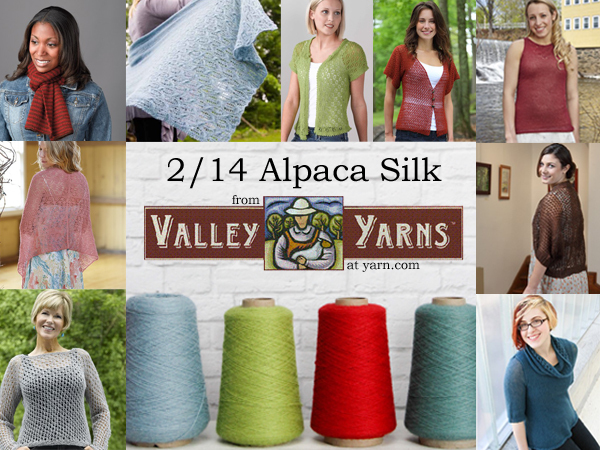 The 2/14 Alpaca Silk is available in 10 hand dyed colors and 25 solid colors. Which will you choose?